Yvonne is a Registered General Nurse originally from Zimbabwe but now based in Durban who has worked in the industry for 10 years. She attained her Diploma in nursing from Parirenyatwa Nursing School in 2008, her Post-Graduate Certificate in sports medicine in 2011 and Advanced Cardiac Life Support Certificate 2016 from Medical Air Rescue Services. Yvonne is a trained Spirometrist. Yvonne’s experience in occupational health has extended to various private occupational health clinics, primary healthcare and research companies. 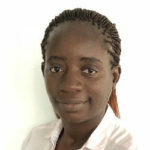 Yvonne has acquired vast experience and knowledge in the health sector with an understanding of pharmacology, diagnosis, research, travel medicine, resuscitation and health education. Yvonne is a dynamic, meticulous, self-motivated and fast-learning individual with strengths in teamwork who enjoys the challenges this field offers her. Her work experiences in different institutions have enhanced her interpersonal and communication skills. She has proven to be a highly motivated healthcare provider and educator with the ability to remain focused in high stress environments. Her commitment to caring for patients and ability to function as an integral part of a team makes her an inspiration to work with.